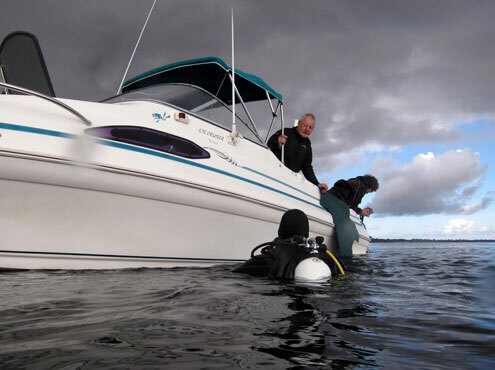 When Lloyd Borrett, owner of The Scuba Doctor dive shop, set up his private dive boat for Melbourne diving in 2011, he added to his existing knowledge and researched the local best practices, taking a close look at what others were doing (especially the VSAG independent dive club), and came up with the following setup. It works for him, maybe it will work for you just as well. You should also take a look at Using a Dive Float and Flag which describes how to use a dive float and flag for additional safety in diving. 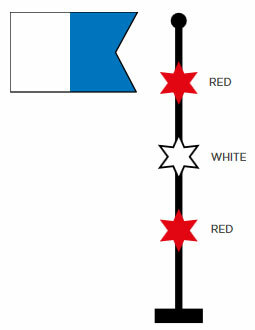 For the purposes of diving operations the vessel should carry a replica of the international Code Flag 'A' flag. This should be capable of being displayed fully extended preferably rigid and should be as large as possible. It should be displayed at all times that divers are in the water. It must not be displayed once all divers have been recovered. Boat Lines, Shot Lines, Drift Lines, Cray Lines, Decompression Trapese etc. To cover the requirements of running the boat, beach launching, plus doing various types of diving, an assortment of lines and buoys are used. 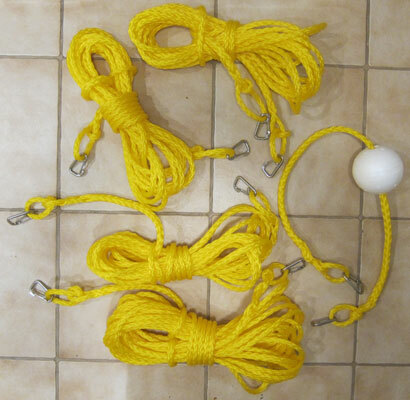 The 10 mm and 12 mm white nylon 3 strand rope, the yellow 10 mm ski rope, plus the 6, 8 and 12 mm stainless steel, asymmetric snaps, described here were purchased from Quarterdeck Marine, in Seaford Victoria. To label various lines, Lloyd purchased a Mills Styrox SPS 33 Business Hours sign from Bunnings. This 200 mm x 300 mm sign can be cut up into eight 66 mm x 100 mm tags, drilled to create the appropriate sized hole, labeled on one side with a Sharpie Permanent Marker, and attached to lines with cable ties. Long Dock/Tow Line: A Blueline Dock Line, 12 mm double braided nylon, 30 metres long, with a soft eye spliced in one end gives excellent shock absorption and abrasive resistance. Purchased from BCF, Braeside Victoria. Shorter Dock/Tethering Line: A Blueline Dock Line, 10 mm double braided nylon, 4.5 metres long, with a soft eye spliced in one end gives excellent shock absorption and abrasive resistance when used as a dock/mooring line. Purchased from BCF, Braeside Victoria. Short Dock/Tethering Line: A Blueline Dock Line, 10mm double braided nylon, 3 metres long, with a soft eye spliced in one end gives excellent shock absorption and abrasive resistance. Purchased from BCF, Braeside Victoria. The Marker Buoy should be a bright colour and easily visible in the sea conditions expected. It must be of a suitable size for the diving taking place and have sufficient buoyancy to support any divers or equipment that may be used for decompression. A minimum of 20 kg is recommended for this purpose. Under no circumstances should the buoyancy of the marker buoy be less than the shot weight. 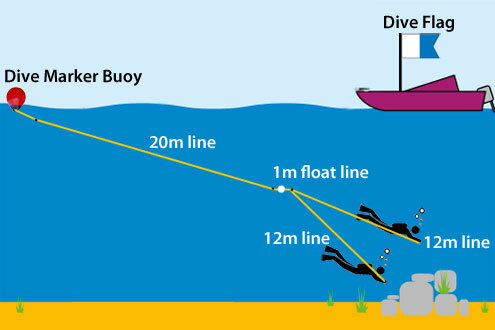 Sufficient line must be used taking into account tidal variation during the diving operation. 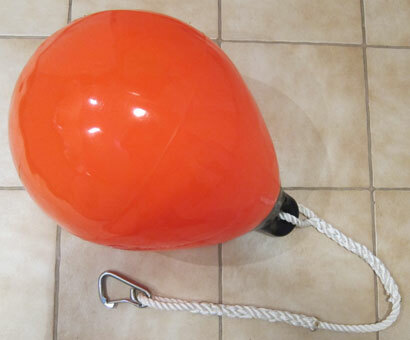 The main marker buoy Lloyd used is a pear shaped, DAN-FENDER Inflatable heavy duty buoy, injection moulded from tough flexible orange vinyl (model B50). Purchased from Anchor Marine, Sandringham Victoria. It features a heavy duty black solid injection moulded eye, high gloss body and metal inflation valve. It has an overall length of 570 mm, 405 mm in diameter, with an eye diameter of 28 mm and a buoyancy of 46 kg. A 1 metre length of 12 mm white nylon 3 strand rope, is used to secure a 12 mm stainless steel, asymmetric snap hook to the main buoy. The snap has a formed eye and strong spring opening action. The rope is securely spliced to the buoy's eye at one end and to the snap hook at the other end. 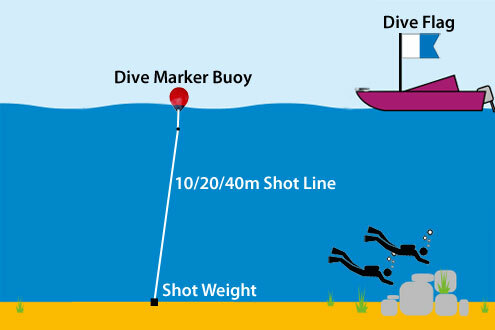 A simple shot line will consist of a shot weight, a suitable length of line and a marker buoy. This equipment needs to be versatile for the various depths of water being dived and suitable for the type of diving being undertaken. A shot should be at least 15 kg if the position is to be marked in tidal waters. The line should not be too thin as this results in handling and recovery difficulties. A shot line diameter of at least 10 mm is recommended. 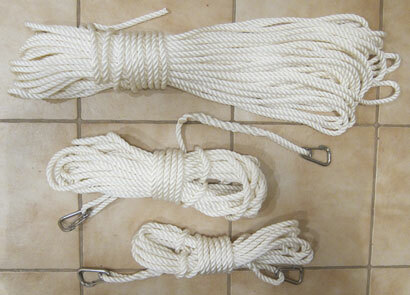 Lloyd setup three shot lines from 10 mm white nylon 3 strand rope. They are 40, 20 and 10 metres in length, which enables him to make up the various length combinations required for the range of dive sites we use shot lines on. Each line has an 8 mm stainless steel, asymmetric snap hook securely spliced onto each end. These snaps have a formed eye and strong spring opening action. Lloyd used nylon line because it's nearly twice as strong as silver rope. This allows a smaller diameter rope to be used which proves cost effective. Nylon rope is the strongest and most elastic synthetic fibre UV resistant rope. It is easy to handle, has great elasticity, shock absorption and abrasion resistance, plus it can be cleaned easily in soapy water. To help determine what the tidal current is doing when waiting for slack water, we have a tidal indicator pip/buoy line. This uses three white solid styrene surface floats — a 150 mm diameter float at the far end, then 1 metre apart is a 120 mm diameter float, then another 1 metre apart is a 100 mm diameter float. About 1 metre from the smallest of the floats a 8 mm stainless steel, asymmetric snap is securely spliced onto the end of the line, which is used to clip the line to the main buoy. The line used is yellow 10 mm ski rope. The main buoy is deployed. Clipped to it is a 20 metre length of yellow 10 mm ski rope with 8 mm stainless steel, asymmetric snaps securely spliced onto each end. A 1 metre long short float line made from yellow 10 mm ski rope, with a 100 mm diameter, white, solid styrene surface float in the middle, plus 8 mm stainless steel, asymmetric snaps securely spliced at each end, is then attached to the end of the first line. This keeps the line up in the water column so as to help the line from being snagged on reefs. 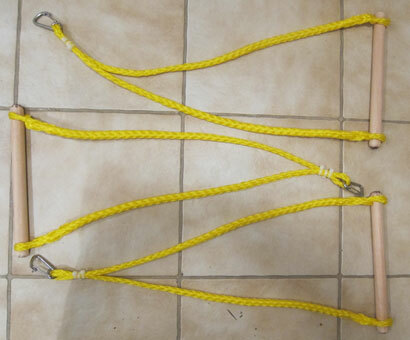 For each diver, a 12 metre length of yellow 10 mm ski rope with 8 mm stainless steel, asymmetric snaps securely spliced at each end, is clipped to the end of the short float line. There is a small stainless steel snap positioned in the line 3 metres from the end, to which a long cray snare can be attached when cray hunting in South Australia. For drift dives, a 250 mm long, 25 mm diameter, wooden handle — one per diver — is clipped to the end of each of the 12 metre drift/cray lines. 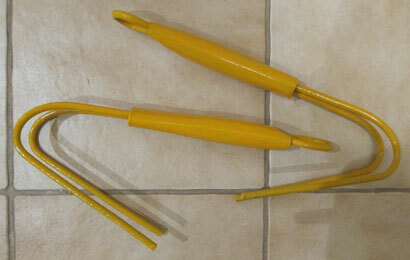 The line is a length of yellow 10 mm ski rope with 8 mm stainless steel, asymmetric snaps securely spliced into the end. For cray dives, a reef pick (reef anchor with just two 8 mm prongs) is clipped to the end of the 12 metre drift/cray lines. The reef anchors are hot dip galvanised, but they have also been painted with two coats of White Knight Rust Guard Cold Gal zinc rich coating for lasting protection, plus two coats of White Knight Rust Guard Yellow Epoxy Enamel. When diving the ex HMAS Canberra, we tie up to a mooring buoy. We then drop a line down from the boat with a 5 kg lead drop weight such that it hangs 5 metres below the boat. The line has stainless steel snaps at each end. The weight has eye loops top and bottom. 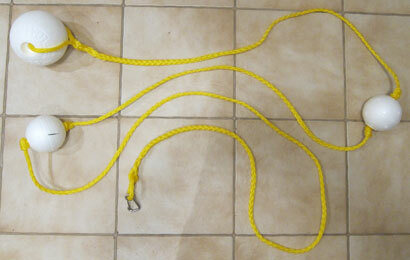 A 30 metre length of Grunt 9mm braided, solid core, multi-purpose yellow colour rope (part # GR0003) purchased from Bunnings, with stainless steel snaps at each end and a small 100 mm diameter white solid styrene surface float attached one metre from the far end, is clipped to the bottom of the drop weight. The far end is then taken by the first diver down to the wreck. A wire coat hanger is used to attach the line to the wreck. The last diver to start the return journey can easily detach the line from the wreck. Even if they fail to do so, a strong pull from the surface will detach the line. Consideration should be given on all vessels to provide a suitable means of recalling divers should the need arise. Whatever method is adopted divers must be clearly briefed on what to expect and what action to take in the event of such a signal being deployed. Note: Divers might interpret this to mean cover boat getting impatient.